“Imagine waking up next to a light sleeper and you have to get to the bathroom but you’re in an pitch black hotel room. Even a flashlight will wake him or her up but you can’t hold it for the next three hours when the alarm goes off. What if you could navigate a hotel room like a bat navigates a cave? With a vibrating distance sensor you can “feel” walls up to fifteen feet away rather than groping blindly. 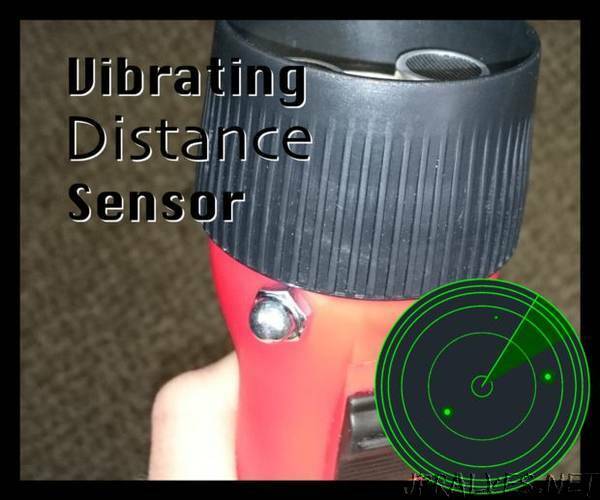 The vibrating distance sensor gives you sonar vision with no training. The flashlight enclosure is easy to build and intuitive to use. Feedback is a vibrating motor that vibrates strongly when an object is close then vibrates weakly when an object is far away. Kids have picked this up and automatically began testing the range of walls and ceilings with no one telling them how to operate it. Just point it where you want to look/feel and you sense if there is something in the way.